As a small nonprofit organization our financial resources are limited. We make the most of what we have, but we constantly search for creative ways to identify resources where available. We’ve created this wish list as an additional way you can help and it’s a great way to recycle and save the environment. All donations are tax deductible and we will provide you with a confirmation to document your valuable contribution. This week’s wish list item is a new or used LASER PRINTER. 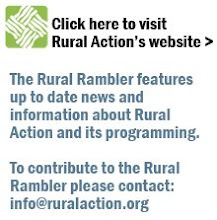 If you can contribute to making our wish come true, please contact robin@ruralaction.org.